In a bit of a coup, MinneBar was able to attract Hansson to become an active participant. In other words, someone in Minnesota knows Hansson and convinced him to hop up from Chicago and apply some glitter to Minnesota’s BarCamp. Thank you, whoever you are! My meager experience has allowed me to see Hansson speak only one time previous. I’m stretching the truth, but I have seen him speak on the online version of last year’s RailsConf keynote. If you have not seen that speech, and you don’t have a deep desire to participate in RESTful Rails development, what are you waiting for? Go watch! 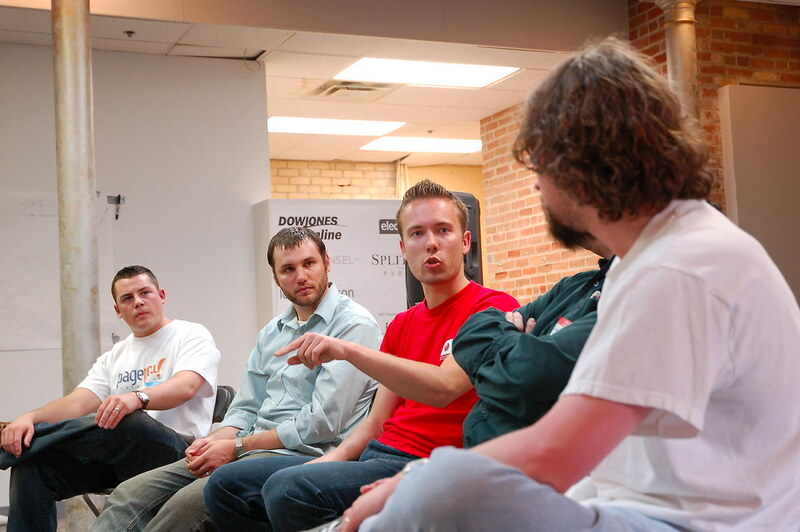 Hansson provided some interesting background into the motivation behind the Rails framework. A particular, some might say unique, goal in developing the framework was to create beautiful code. Hansson has a strong belief that beautiful code leads to happier developers. This should entice developers, and folks managing developers, because motivate coders will invariably be more productive coders. In a somewhat surprising move, Hansson spoke very adamantly against Rails plugins and gems. He feels some duplication of code between apps is worthwhile to avoid obtuse breakages later (this is a knock against gems). He also feels that plugins railroad a developer and abstract at too high of a level. Often, it is best for future support of an application to bake one’s own authentication system, for instance. After a little bit of experience in the realm, I’m in agreement with Hansson on this one. Hansson made a final point that he loves working in Chicago. His reasons are clearly opinionated and are meant to state what works for him, but I’ll share them here anyway. A benefit of the coastal startup hotbeds is also a demerit. The very active community can entice a programmer to over-commit to the activities involved in getting a toehold in said community. Diminishing returns arrive quickly when attending conferences/user group meetings/networking events. It’s a bit easier to keep on an even keel in the Midwest. This goes for balancing work and work-related activities as well as work and life. It’s a little easier to unplug from the startup mentality when everyone around you is not also in a startup. The statements were all very personal, so obviously every one of us will have our opinions on how a community and culture would impact our own productivity. In any case, his opinions were very apropos to Minnebar. All in all it was an intimate, laid back setting. I think the setting allowed Hansson to remove some of that veneer that bothers many folks out there. If you are one of those who dislikes Hansson, I recommend finding a podcast or something similar that involves him in a more laid back setting. Like this one for instance.